Meal For Two Under INR 250 in CP? Yes, Please! Halka Fulka is a handy roll joint in Connaught Place that serves Rolls halka on pocket and heavy on taste. Located opposite Route 04 in Inner Circle, you find an auto rickshaw stuck in the wall selling rolls. Halka Fulka is a teeny tiny takeaway joint that has no seating options. But who minds taking a stroll in CP whilst gorging on delicious rolls? I discovered this place while strolling around in CP and the auto rickshaw caught my attention. The Double Egg Roll was filled with crazy sauces, fresh onions and lots and lots of egg! If you want something meaty, the Chicken Seekh Roll is a delight with bits of perfectly-cooked chicken and sauces. The Paneer Roll is pretty good too but if you’re non-vegetarian, I’d recommend sticking to the other ones. Rolls can make your thirsty and the cold coffee, shakes and aerated drinks here make sure you don’t need to head anywhere else. 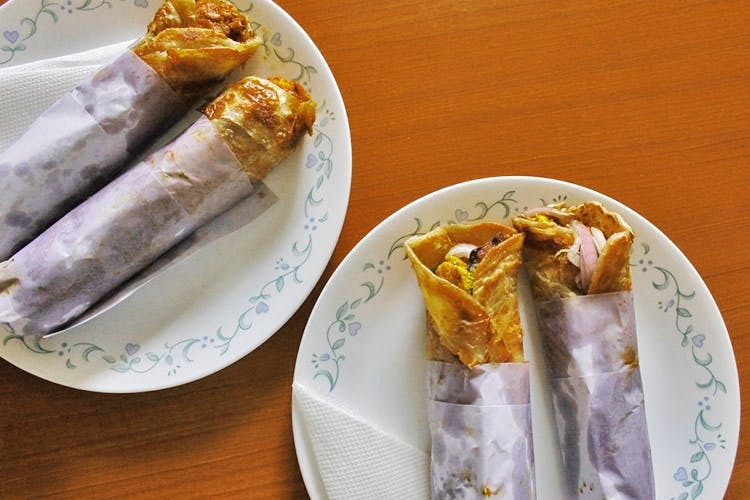 Pay Halka Fulka a visit when you’re broke post shopping or craving some amazing rolls. PS: They have another outlet at Lajpat Nagar and deliver through Swiggy.